For some, it may be easy to consider one accounting solution the same as the next. If you can balance your books, submit reports, do your taxes and keep track of projects, what’s the difference? Here at Intuit®, we believe there’s a big difference. Today, Brad Celmainis of Brad Celmainis Accounting Solutions offers three key benefits of QuickBooks® Online Accountant that Canadian accountants, bookkeepers and tax preparers should know about – benefits you won’t get with other solutions, particularly as it relates to the needs of accounting professionals living here in Canada. He first started with QuickBooks Desktop. When he considered joining the cloud accounting world, he noticed that Intuit had an online offering. In 2015, he attended a live training where he converted his QuickBooks Desktop file to QBO and was certified as a QuickBooks ProAdvisor®. Since then, he’s centered his consulting business on QBO, Canada’s most popular cloud accounting platform. “I love being in the QBO space,” he says. 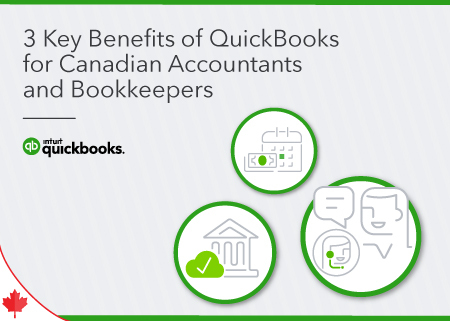 While there are more than three benefits of using QBO, Brad feels the following are key for Canadian accountants and bookkeepers, and that they distinguish Intuit from other cloud accounting systems. 1. Tame bank fees with the best in bank rules. QBO Bank Rules allow users to automate the categorization of bank feed and credit card transactions. You can assign transaction type, category, payee, class and location. Be prioritized over other rules, copied, edited, and exported or imported for use in other QBO company files. Add transactions to the register automatically. The timesavings, customization and control you receive from QBO Bank Rules, combined with the reduction in bank fees, is powerful. While other accounting systems may offer their version of Bank Rules, Brad was swayed by QBO’s ease of use. “I found QBO to be intuitive and user friendly,” Brad says. 2. True localization capability (plus integrated solutions). It’s one thing to say that your accounting system does localization, but it’s another thing for it to actually do it. With Intuit, QBO packages are made specifically for each country. We adapt our cloud accounting software for each region and language. This is different than offering a global package that must be customized. “QBO has a Canadian version that is designed specifically for Canadian accounting and bookkeeping needs,” Brad says. He also says QBO gives Canadian users the ability to “drill into that GST figure and have a tax profile set up so you can manage tax beyond the basics,” which sets it apart from competitors. As he says, Intuit isn’t a “cookie cutter” accounting system. Intuit’s new Advanced Payroll offering is also integrated into QBO and allows users to pay employees easily, accurately and on time. You don’t have to worry about tax rates, you can customize pay options, and you and your employees receive free direct deposit. 3. Award-winning telephone support. Customers rely on tech support to answer questions or address concerns. Customer care and satisfaction is of the utmost priority for Intuit, and we’re very excited that our Frontline Care Team won a 2018 Silver Stevie for Front-Line Customer Service Team of the Year. With over 400 Canadian employees, QBO users can be assured that Intuit is focused on meeting their specific accounting and bookkeeping needs. Is QBO the Right Cloud Accounting Platform for You? Like Brad, we feel these three benefits are important for Canadian accountants, bookkeepers and tax preparers to consider as they compare different cloud accounting platforms for their firms. We also feel they set Intuit apart from the competition. If you’d like to learn about QBO’s many other benefits, check out our QuickBooks Online Accountant website, or contact our award-winning customer service team, located directly here in Canada.